The macula is the central portion of the retina - the part of the retina that is responsible for detailed vision, such as reading. 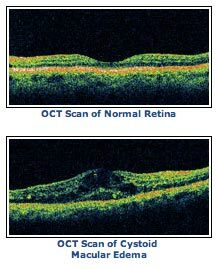 Cystoid Macular Edema (CME) is a condition in which the macula becomes swollen with fluid-filled cysts. CME can occur in the setting of diabetes, retinal vein occlusion, or uveitis (inflammation inside the eye). CME is most commonly seen after cataract surgery. Symptoms About one to three percent of patients will have decreased vision due to CME following cataract surgery. Often, the patient will experience improved vision following cataract surgery, and then vision will begin to grow more blurred one to three months afterward.